I fancy something different, so i have decided to post a pic everyday of some nail art some will be just colours, others will be a design. This is a challenge from a professional forum i use , so i dont choose what goes up lol i just have to post something here and in the forum. So today is yellow. 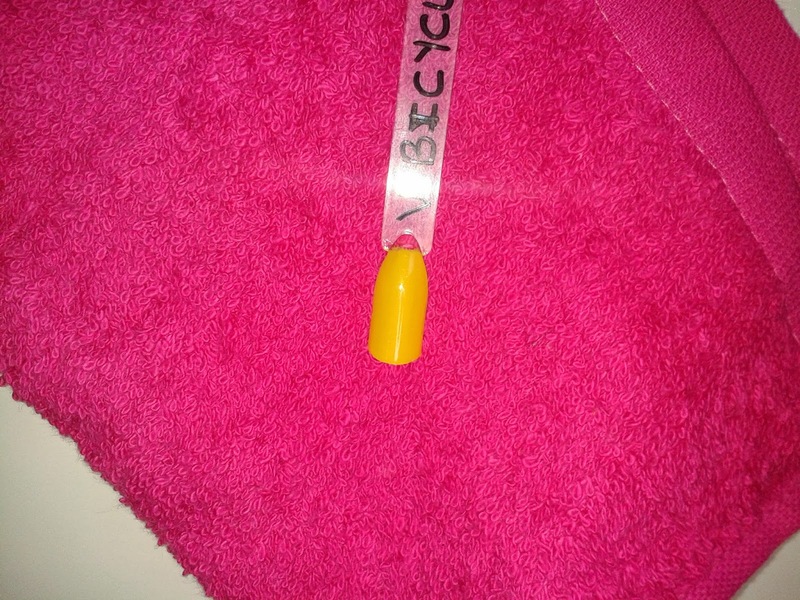 This is Bicycle Yellow CND Viynlux polish from there new collection, it has a top coat you must use with it and its dry to go in 8.5mins! No smudges no chips fab colour and nails for one week. Over the next few month's we are bringing in some new treatments. The first treatment will be waxing which is a popular salon treatment for both men and women, i will be putting together treatment packages for both male and female grooming. September see's a new treatment with eyelash perming, so out the eyelash curlers and treat yourself to beautiful curled eyelashes that last between 4-6 weeks, with this comes eyebrow and eyelash tinting, so you can combine a few treatments at the same time! I am still looking into body wraps, as another one has just hit the market which is giving SV a run for it;s money, so depending on time i may bring one in before xmas or leave it until the new year. So what ever treatment you are looking for pop over to www.crystal-nails.org.uk for a look at my website, prices are very competitive and flexible appointment times too. There seems to be a large amount of nail tech's and spray tanners that suddenly pop up with no training and no insurance, to be honest i blame these one day courses where they teach you how to do nails. You cant learn acrylics in one day, i know of a person that has done this, then went on to buy spray tanning equipment secondhand, no training and no insurance, although i have spoken to this girl and asked her why she hasnt got insurance i got no reply. Fails to amaze me you wouldnt drive your car without insurance so why claim to be a professional and trade without it! I know the industry has yet to be regulated that is partly the problem, but with sites such as fleabay selling these products to people it is certainly not helping,i wouldnt dream of buying a product off of a site like that, you never if it is the genuine product. It so does annoy me to the point of naming and shaming but then that would be unprofessional on my part. And it's unprofessional to comment on a tech's work, but it happens and there is not alot you can do about, infact i wish there was something i could do about it! Well i am hoping that is not the end of the summer for us. We have the new CND Viynlux Polish in the salon, it's been a struggle getting colours as it is so popular but i have a few more now. I had planned to introduce HD Brows this summer although i am still going to be doing the training i have decided not to use that brand and the aftercare products are very exspensive for clients to buy, so i am looking elsewhere and have possibly settled on Brow Buddies instead. Same procedure as HD but with out the huge price tag attached to it! I am also looking into retailing Choloate Banana weight loss products in the next few months as well as teeth whitening kits that you can use at home. There will also be a retail section for manicure and pedicure, and before xmas we will have introduced waxing so there it's happening in the salon. Hi folks, seems to be an awful lot of cheap nails doing the rounds in Falkirk at the moment. Not sure who, not sure i want to know lol, but use professional techs just cant compete with those prices. I have now dropped my prices to see of that attracts new intrests, have 3 ladies coming for half price nails, just means they get to be my advert for nails and also hand out business cards for me, that is all part of the deal. Looking at adding more services in the beauty line and possibly getting rid of things i am doing see how that goes i think. Well i was hoping by now to have seen at least a few days of sun here, but not as yet. I am looking forward to starting my HD Brows training in July and will be offering it in the salon from 1st August, along with a few other new treatments on the menu too! For the first time i had seen nail damage caused by another salon where i live. I had heard about this salon and there get them , get them out attitude but had never met anyone who had been there, although they have been totally dead in the month or so, now i know why maybe? So many people go and do these one day nail courses, and then go and set them selves up as a nail tech, when will people learn you cant not learn everything to do with nails in one day. I know learners no know better and wan to get qualified as quickly as possible and earn some quick money, it so does not work like that, it takes time and lots of practice and study to get qualified to be a nail tech. Many hours of trying hard to perfect something which one day just clicks into place for some strange reason. I spent a year learning to be a nail tech i have a long way to go and so much to learn that will not happen overnight, but i love learning and i have big plans for my small business.